Every year, parents of school aged children brace themselves for the great school supply list. Last year, I wrote about my son’s first grade list and asked other people what was on their list. One week ago, NHL came home from school after his last half day. Inside his backpack were several items. In addition to his report card, the manila envelope contained the name of a teacher that NHL likely will have for second grade. What does that mean you ask? The exact words on the paper "Your child has been tentatively assigned to ___________ for the 2010-2011 school year. Please be aware the assigned classroom is subject to change." Not too sure what that means since there was NOT anything like that last year. Also tucked into the papers was the 2nd grade school supplies. I guess we shall see. one box of 24 crayons – no larger! I do have some of the items at home already thanks to great sales last year and teaching supplies that I still have on hand. We will keep an eye out for the back to school sales, which will begin next week (typically after July 4th). I am intrigued with the correcting pen. I really like that they will be editing their own work and hope this will address my concern with inventive spelling. The pencils and crayon bits are now tossed, but the box is still in pretty good shape. I still have to see if the glue sticks are dried out or can be used for summer projects. My next thought is whether or not we will need to get anything for JSL. *gasp*. . . my baby starts nursery school in September. Of course, right now the biggest item on my supply list for him is to get underpants on him. The two of us are still working on the power struggle that is potty training. At just three years old, I do not want to push him too much, but I KNOW he is ready. Oh well, that is a story for another day. If you have school aged children, what is on your list this year? As a parent and former teacher, I am always curious to see what the lists look like at different grade levels. Yeah ours is big again this year. 48 yellow pencils. 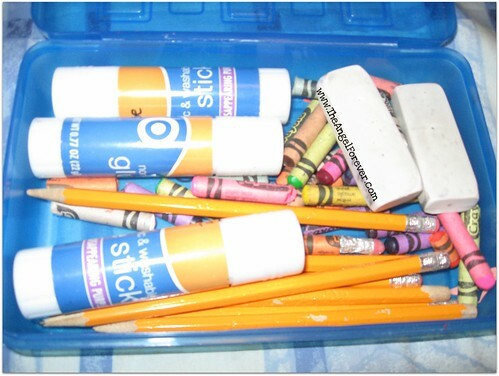 6 large glue sticks. AhHHHHHH! another thing to get nervous about. The only two things I’d add for second grade was a box of plastic bags & a bottle of hand sanitizer for the class to share. Half the class was assigned qt bags & the other gallon bags.